End-to-end solution integration (E2E SI) is essential when creating a business plan for IPTV service offerings. Rather than taking a piecemeal or partial approach to integrationwhich often results in unacceptable end-user quality of experience  operators need a comprehensive method that addresses all aspects of the IPTV implementation. The approach discussed in this white paper is derived from experience gained from actual IPTV implementations over a number of years. The challenge of integrating new technologies, features and services into the service providers network is complex and demanding. The transformation process usually involves maintaining existing services while developing and migrating to the new service environment. To cope with this level of complexity, many service providers turn to a partner they can trust to help them transform not only their network and services, but also their business operations. This usually includes a combination of professional consulting and integration/deployment services. The SI partner should have specialized lab environments that allow it to pre-integrate end-to end solutions with its own best-in-class partners. The labs are also used to develop the stringent processes required to carry out realistic proof of concept, trial, and commercial deployments for the service provider. This paper describes how to perform IPTV solution integration, blending end-to-end IPTV component technical knowledge with a strong business-focused approach to create closely integrated work packages that are strung together via a golden thread that ties together all deployment lifecycle phases for maximum efficiency and consistency, making IPTV deployments and enhancements predictable, reliable and successful. The golden thread is a proven formula and methodology based upon many years of lessons learned in the field. Head-end and head-end subsystems  Includes broadcast service components with relevant redundancy and management capabilities. These components include all the equipment needed for content ingestion, encoding, encapsulation, and encryption, as well as DVB data extraction components. Edge-QAM subsystem  For cable operator deployments, the SI partner must have the expertise to perform supplier management and integrate the selected edge-QAM hardware within the end-to-end solution. Content management system  Enables the content providers and the operator to self-manage the full content lifecycle from offline encoding, via ingestion and metadata management, pricing, packaging, bundling, marketing campaigns, through distribution and storage management. The CMS solution is a collection of integrated components covering the required lifecycle functionality of all content types. Content protection: conditional access /digital rights management (DRM)  A suite of integrated components covering all aspects of content encryption/decryption. Tight integration between all solution components and the CA/DRM vendor components is required. Video on demand (VOD) server and back-office systems  Video (or streaming) servers are responsible for pushing the content over IP via standardized protocols. Integration of the streaming servers with the head-end, CA, middleware and content management is required. Video services middleware platform  Central IPTV component carrying all the business logic of the IPTV service and responsible for interfacing and managing all solution components and players  e.g., underlying network, head-end, CA, video servers, back-office legacy systems (e.g., OSS, BSS, Customer Relationship Management [CRM]), Content Management Systems (CMS), Integrated Access Device (IAD), set-top box (STB), and end user. Transport and access networks  the characteristics and capabilities of which bear heavily on service levels delivered to end users. The network is an integrated part of the overall end-to-end video solution and should be considered as such throughout the entire process of strategic planning, design and deployment. Customer premises equipment: residential gateway (RG)/IAD and STB  The RG/IAD enables the operator to perform end-user provisioning and home device management. The STB is the main component the end-user interfaces with. The STB typically interfaces with the middleware either via a native client or web browser. An experienced SI should be able to perform vendor evaluation for all solution components selection, including proof of concept, interoperability tests, benchmarking, and shootouts. Once the solution component is selected, the SI directly interfaces with and manages the supplier on behalf of the operator. A business-focused approach implies that the SI must be aligned to the service providers deployment journey from the initial services concept through commercial launch and beyond. Figure 1 below shows the typical phases an operator undertakes when launching a video services solution. Moving through these phases provides the operator with maximum confidence in the services readiness in terms of stability and functionality. This approach also minimizes risks while receiving user feedback prior to commercial launch. The schematic indicates several phases of market scanning along with one or two friendly user trials. Following commercial launch there are usually growth and solution extensions and enhancement phases. Eventually, a product enters a steady state period. At this stage, the solution is not frequently enhanced or extended, user growth is predictable, and at some point a decision is usually made to reinvent or retire the product. Due to the emerging nature of the IP video business and the ubiquity of IP, many of the current commercial IP video offerings are more likely to be enhanced into new products rather than retained in their current state. Because service providers are historically very experienced in product introduction, an internal methodology usually exists  albeit focused on a different type of end-user product. Every provider has a different focus, experience, requirements, and way of working, which results in a well understood internal methodology. Usually this methodology is a set of traditional processes that the organization adopts when deploying new services that fit the organizations structure, behavior and culture. These processes and procedures  down to the smallest details  have become an integral part of the organization and constitute a methodology that the organizations team members are accustomed to working with. The SI must take this internally developed methodology into account when assisting in an IPTV deployment. Experienced solution integrators have developed a project lifecycle methodology to guide their integration services. They also have created methodologies specific to individual solutions such as IPTV. The more experience the integrator has, the more its methodology will be end-to-end focused and complete. Superior methodologies, which can take years to build, should be flexible enough to align with the service providers internal processes and existing methodologies as highlighted above. Simply adopting the integrators generic methodology may not be the optimum way to achieve the desired project results. The integrator should work with the service provider in order to understand the organization, culture and current methodology being applied to new service introductions. This allows the integrator and provider to collaborate on creating the optimal methodology for introducing video services  a methodology that best fits the service providers organizational structure and culture. In addition, it will thoroughly cover relevant video service solution areas, ensuring that all high-level criteria required for such a deployment are met. The work packages are defined to meet specific customer business and technical needs. They also take into account the organizations operational structure and include an estimated effort in time and resources. Adding all work packages and workstream timelines provides the overall project duration. 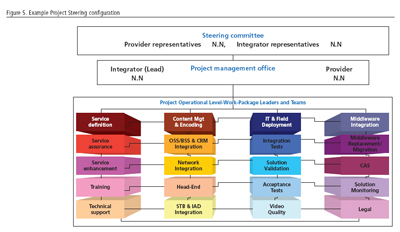 The figure below shows typical solution integration project subjects (workstreams) that fall into the high-level steps described above. When drawn in a linear fashion, the timeline provides an initial idea of the entire projects duration and scope. The work packages building the work streams are addressed as independent but correlated sub-projects. Each work package has its own scope of work duration, and associated resources for execution. An experienced SIs portfolio for IPTV should be constructed on a set of carefully selected field-proven work packages. Furthermore, the design of each work package should allow execution individually or in conjunction with others, depending on actual project requirements. A typical IPTV solution integration project involves many work packages. These work packages not only function as stand-alone modules, but also must be able to integrate with all other work packages. The ability to deal with the complexity required to bring all the work packages together as an E2E solution is the key characteristic of a successful, professional SI. As indicated in Figure 3, each work package may consist of dozens of subtasks and activities, and is usually handled as a project on its own with a dedicated project manager and team. However, the golden thread methodology applied by professional sis ensures that the single work package is closely linked to all other work packages associated with the project. As indicated in Figure 4, each work package goes through a series of high-level methodology steps to ensure that all required information is available, that nothing is hidden from the team and that work package activities truly reflect all aspects of the project. In a typical service provider project, work packages move through the consult, design, integrate, deploy and maintain cycles. When mapping the work packages to the five-step high-level methodology, the SI may find that some work package subtasks are already in process or partially complete. It is the job of the integrator to identify where each work package is in the five-step process, to verify that the steps already completed actually meet the required criteria, and to continue the process for the work packages as defined. For complex end-to-end IPTV solution integration projects, strong focus on program management is one of the keys to ensuring the fluidity and interaction between work packages, as well as overall program tracking and communication. It is advisable to have highly experienced program and solution managers as solution implementation integration and deployment leads. The solution manager role typically involves making sure that all input is gathered, performing an overall status analysis, and consolidating the issues and risks associated with all project teams, including third parties. Specifically for third-party management, the solution manager should have access to all relevant information on the technical and operational aspects of the suppliers solutions. The solution manager initially manages the project organization setup and resource assignment involving the SI, service provider, and third-party organizations as mentioned above. Subsequently, the manager actively steers the project organization; this encompasses all work-package leaders and teams involved. In order to do this, the manager should be closely aligned with peers in the service providers organization, as defined at the start of the project. A multilevel project management discipline is recommended to ensure deployment success. This typically involves a program management office structure that is responsible for taking the project from service description through commercial deployment. The project organization should include key service provider personnel who will steer and manage the project. A time-tested approach, depicted in Figure 5, is to create three project levels: project steering committee, project management and project operational. For smaller projects, only the project management and operational levels are required. This level includes representatives of the sponsor and enabler of the project. They articulate the projects business-related goals and provide the project management level with the authority to manage the project as the leading team. The representatives meet at intervals determined by the businesss size and relevance of the project  typically once per quarter or, for very large projects, on a monthly basis. Because the steering committee is comprised of executives from the involved parties in the project, it is the highest level of escalation in case of disputes. This approach also ensures executive participation in risk assessment, investment alternatives and project roadblock management. The project management team usually consists of program managers, sales managers, contract administrators, financial controllers and technical project managers responsible for field operations and third parties. Depending on projects overall scope of work  i.e., the number of work packages and their contents  this team can be extended by adding personnel associated with specific functions. These specialized team members can work either full or part-time depending on project requirements and planning. The project management team, led by a global project manager, acts in a matrix function on top of the standard line organization. This project manager is also responsible for actively managing the project work packages. Project operations are under direct control of the project management level and usually consist of teams gathered from the service provider, SI, and third parties. Depending on the project phase, the operational level teams usually consist of tender, operational, and installation and commissioning staff, as well as business consultants, legal specialists, and engineering staff. Also included are staff with other technological competencies needed by the project management team to achieve specific project objectives. The project operations teams are responsible for delivering project-specific, predetermined deliverables by executing the statement of work defined for their assigned work package. For a complex implementation such as IPTV, the negative consequences of deployment errors and implementation shortcuts underscore the need for a well-designed project delivery methodology aligned with the service providers business goals. Lessons learned based on global implementations have led experienced solution integrators to develop an IPTV solution integration approach that is flexible and also mitigates the most common risks and pitfalls that service providers are likely to encounter. Most effective is a business-focused approach that breaks down typical project methodologies into specific work packages. These work packages are carefully developed and aligned to the service provider organization and capabilities. They are then executed under strict control from a multi-tier program management organization. Assigning specialists with specific expertise to each work package, and supporting the entire effort with resources such as in house lab facilities, provides both the solution integrator and service provider with a high level of confidence that they will achieve a successful IPTV integration and implementation. You are currently browsing the archives for the set-top box (STB) category.